As in past years, any area of our yard that gets full sun is cultivated for vegetable gardening in the summer. Aaron is a gardening master. And while most people would say that I’m the stereotypical woman with all sorts of nurturing instincts and he’s more of the brute hunter-gatherer, when it comes to plants we are totally opposite. 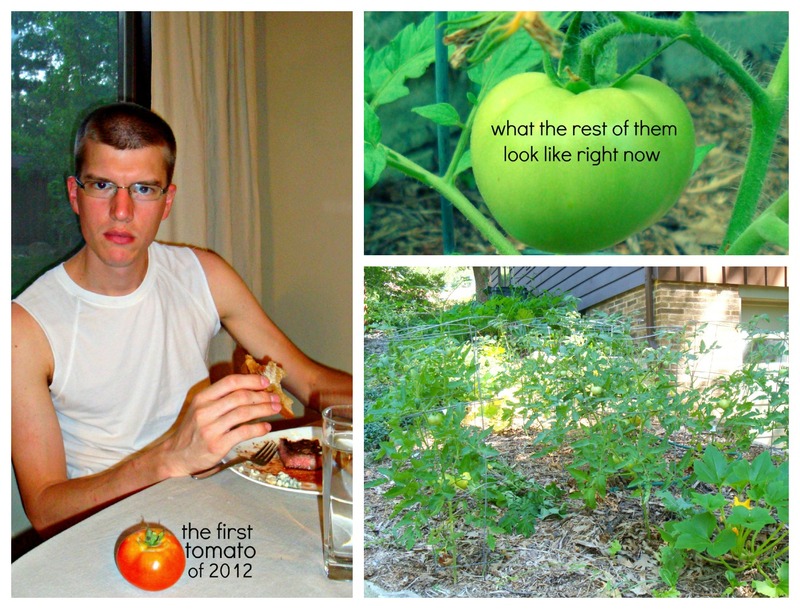 All the gardening successes are his, and we have already enjoyed 2 fresh tomatoes. The first one is pictured here, and Aaron chose not to smile because he wanted everyone to know he takes his agricultural projects very seriously. Then over here, I will confess my own gardening disaster. This is the third year in a row that I’ve entirely destroyed a bunch of plants. This isn’t supposed to be that hard, and I’m determined to get the hang of this before I turn 30. 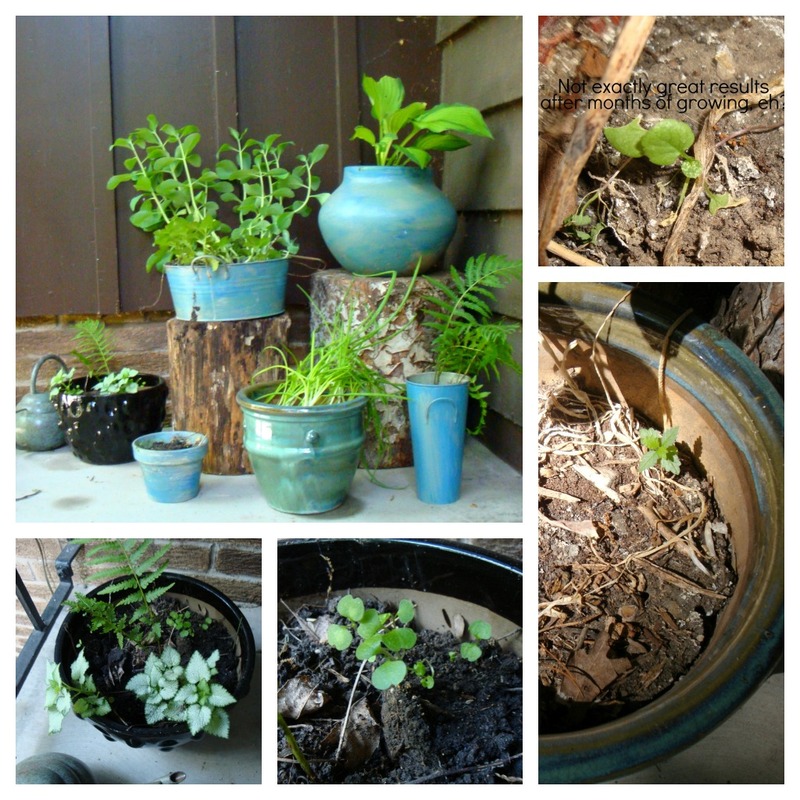 I started a bunch of pansies and something else from seed in the kitchen this spring, then transplanted them into pots, along with ferns, hostas, and sedum from the back yard. I painted almost all the planters to match each other and selected some stumps to use as plant stands. I give myself an A for artistic vision, a B on decor follow through, and a D on plant-nurturing. I won’t say an F since some of them are still alive. They started off well, which you can see in the big picture, but the two side pictures illustrate what it all looks like now. I should also mention that, since I wanted to make salsa this summer, Aaron ordered some onion plants and I carefully followed his directions for planting them in the big garden. They were also a total bust – they barely grew! We pulled them out to give more room for the tomatoes, so I chopped up what I could and threw them in the freezer. This way I can still say at least two of the salsa ingredients came from the garden.